Ledyard, CT, May 3rd, 2019. 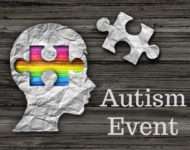 The Autism Education Conference hosts speakers with fresh perspectives, valuable insights, and practical strategies on autism education. Therapists, educators, parents, related service providers, and anyone interested in learning more about this field are invited to attend. Networking with speakers, exhibitors, and other conference attendees. AUTISM SERVICE DOGS – The Powerful Impact Service Dogs Can Have on Children with Autism (with KATY HARRISON OSTROFF). The conference workshop will address how Service Dogs can affect the lives of children with autism and their families. KNOWLEDGE IS POWER – How Relationship and Sexuality Education Can Help Keep Students with Developmental Disabilities Safe. With KATIE HANLEY. POSITIVITY – Positivity™ is an online behavioral solution to support classroom management, empower students’ self-regulation, and automatically collect behavior-related data. Dr. Peg Donohue – Peg is an Assistant Professor in the Counselor Education and Family Therapy Department at CCSU and Coordinator of the School Counseling Program. Robin Fox M.Ed. Robin is an award-winning educator and professional improv actor, has worked in private and public schools, K-12, as a special educator, professional trainer, and consultant for over thirty-five years. Katy Harrison Ostroff, LICSW is the Manager of Client Services for NEADS World Class Service Dogs.